Person | Have kids, they said. It'll be fun, they said. 1. I am FAR too young to have been doing anthing for 20 years. Ludicrous. 2. I’ve been friends with my bestie, my person, my bff, my buddy-o-pal, for 20 years. And, because she is my person, when I informed her of my revelations, her reply was simply, “No. We are too young for that carry on”. It was third form. The very first day at high school. I was a nerdy and awkwardly tall girl. She was a nerdy, rather short girl. Both of our middle names started with L, so, really, it was meant to be. We became fast friends, we had a shared love of drama (which, naturally, caused issues later on in our teen years!) and we just fitted. We fought, oh lordy did we fight. As only teenage girls do, really. Such was our closeness that one day we arrived at school dressed completely identically. People scoffed and laughed and teased us for “planning it together”. The ironic thing was that we had zero discussion – it really was entirely coincidental! Needless to say, we started to plan our outfits to avoid that happening again! After high school, I moved to another city to pursue my short lived career as an actress (learning very early in the year that it was not the life for me!). Friend visited me frequently, eventually also moving to the same city. At some point in the years after school, we drifted apart. There were 8 or 9 long months where we had no contact. We just fell apart. We were growing up, we had differing outlooks on life, and we had our own lives. And then we drifted back together again. This time our friendship was different – we were no longer friends because of having been friends for so long. We were friends because we were two adults who just kind of liked each other, liked hanging out. In our mid-20s, Friend worked hard to save for her O.E. (Overseas Experience). And then, she went. All the way to the UK. We kept in touch through occasional emails – this was, of course, before Facebook was as common as it is now, so email was the “old fashioned way” we contacted each other. Me: Oh my gosh, funny story – I’m pregnant! Friend: Oh my gosh shut up. ME TOO! On opposite sides of the world, we were not only both pregnant, but due within days of each other. Friend’s son Big is three days older than Princess. Again, people joked and scoffed about “planned pregnancy conspiracies” but, just like that matching outfit all those years earlier, we would have had more luck planning not to match. I went on and had two more kids, Friend went on to have one more. And here is the thing. Friend and I have known each other for twenty years, we live on opposite sides of the world. And we talk every day. Thanks to the wonders of technology, we talk at least once a day. We compare parenting styles, we talk about the mundane (grocery shopping, eyebrow shaping, etc) and the very not-mundane (health problems, stresses and worries). When it is my morning, it is her nighttime, and vice versa. After being friends for twenty years, we have drifted and fought, we’ve cried and laughed. We started being friends because we both had middle names starting with L. We remained friends through the wonder of having children and learning to survive in the world as a mother. If I have a problem, an upset, a funny story or a dress I like the look of, I tell her. And I like to think she does the same thing. And, more than that, she is one of my most valuable assets when it comes to parenting advice, opinions and support. Because she is in the exact same position. Neither of us really know what we are doing! 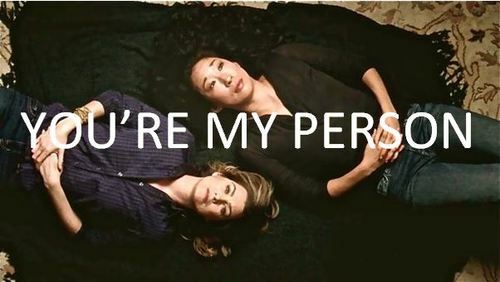 She is my person, and I am hers. And I only hope my kids are lucky enough to have a person in their lives too, when they look back and realise they have known someone for 20 years.